Google, iCal & XML Event List Calendar for (music) festivals, seminars and business events. 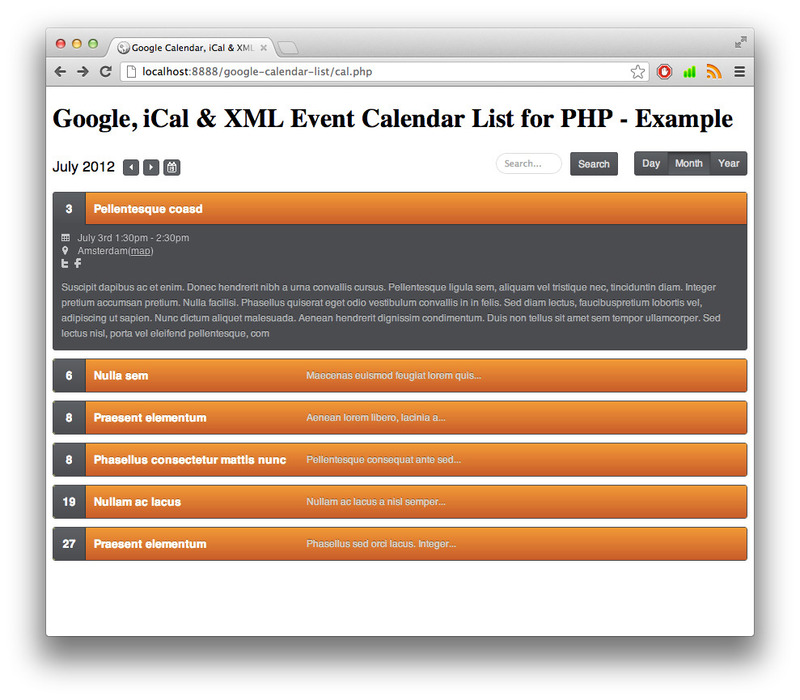 Built on jQuery and PHP, this calendar grabs your events from your Google Calendar, another iCal (.ics) stream or just an XML file, and turns them into a comprehensive list. Events support locations and include Twitter and Facebook links to share the event on your social networks. Skins are included to adjust the calendar to any existing website. Caching is integrated to save bandwidth and increase speed, and everything is Search Engine Optimized (SEO). 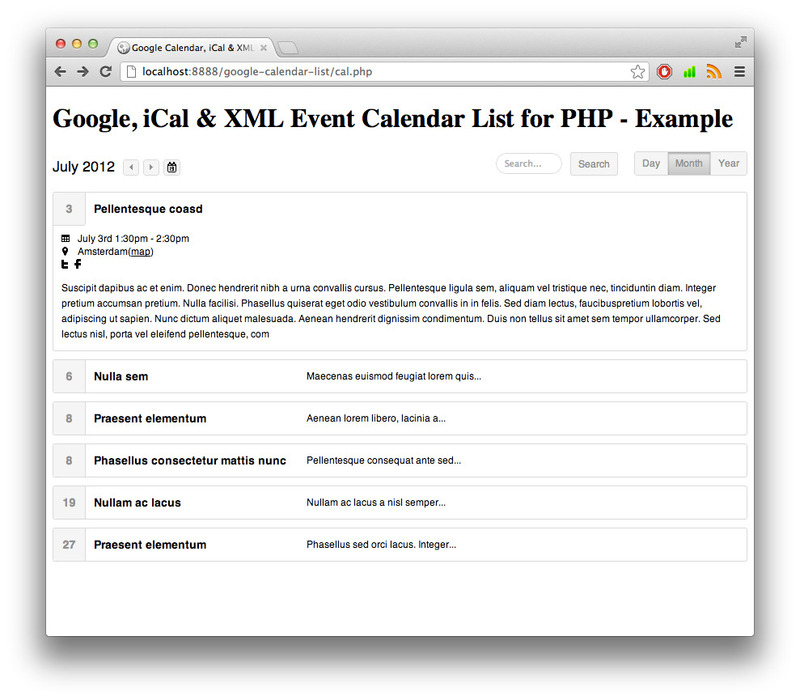 Get events from Google Calendar, iCal (.ics) or XML. Event grouping and integrated search. Integrated Twitter & Facebook buttons. Day, Month & Year layout. 3 Color Schemes (Light, Leaf & Insect). Strings (“day”, “map” etc) are easy to translate. Here’s a list of options for the calendar, just so you can see a complete feature list. More information is of course available in the documentation. 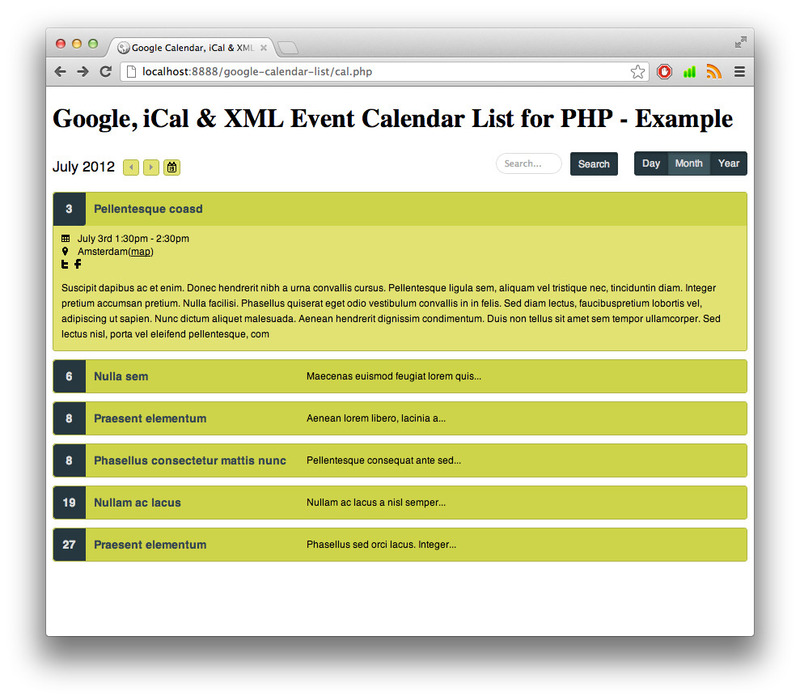 url: This is an array of the links to your XML files and/or iCal (.ics) feeds. All links & feeds will be merged together. It is a required option. Both external (http://) and internal files are allowed. In the next chapter you can read how to access your Google Calendar feed. cache: Choose to enable or disable caching. When enabled, the script will cache the calendar events so it doesn’t have to download them upon every request. Cache files will be stored in the cache folder. Empty the folder to clear the cache. cache_dir: The path to the directory where you want your cache files to be stored. cache_token: If you place multiple calendars on your website with caching enabled, you must make sure they each have a different cache token so the appropriate cache files will be used. cache_time: The number of seconds a cached file will be used. After this time the file with event data will be re-downloaded and cached. 1 hour = 3600 seconds. excerpt_length: Next to the event title is a shortened discription available. The excerpt_length is the maximum number of characters the description may be. This is to ensure that long descriptions won’t break the calendar. Set to 0 to disable. auto_title_width: When enabled, the event descriptions next to the titles will be aligned with eachother. group_events_by_date: When enabled, events of the same day in the monthly and yearly view will be grouped together. group_events_animate: If group_events_by_date is enabled, this option enables or disables the animation when a user clicks on a group. scale: This is the layout of the calendar. Choose between “day” (which will list events per day), “month” (which will list events per month) and “year” (which will list all the events of the whole year). scale_change: If enabled, 3 links will pop up in the top-right corner of the calendar so the visitors can change the layout. date_change: If enabled the visitor will be allowed to look at different dates of the calendar other than the default date. date_picker: This option shows or hides a small button, which when clicked shows a calendar widget to make it easier for users to cycle through dates. date_picker_keep_scale: When enabled, the scale (day, month, year) will be remembered when the date is changed using the date picker. dst: When enabled, the calendar will take daylight saving time in account when calculating the start and end time. Keep this disabled when you’re already taking daylight saving time in account when generating your iCal feed. social_links: This will display a Facebook and Twitter button in each event description, which will both have a link to the event. show_map_link: When enabled, a link will display next to the location, which opens Google Maps. 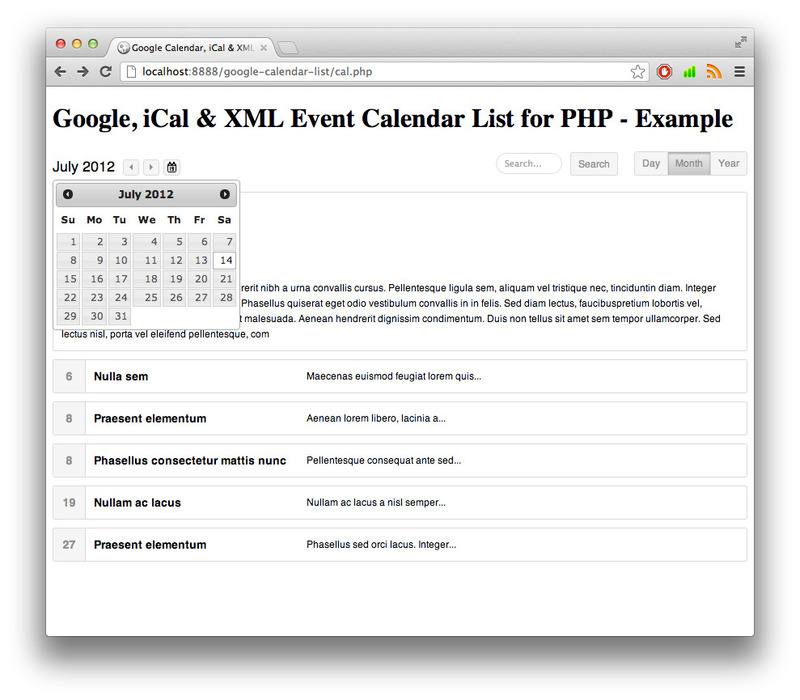 search_form: This will display a small search box above the calendar so users can search for events. search_all_events: By default, only the events that are currently visible will be searched through, but if this option is enabled, it will search within all the events of the calendar. time_format: Choose the time format. Either 12 or 24.
extra_time: If the event start and end times are off by a few hours, change this option. The extra_time is in seconds. 1 hour = 3600 seconds. date_day_addition: Add ‘st’, ‘nd’, ‘rd’, ‘th’, etc after the dates. Turn off this feature when you’re translating the month names into another language. skin: Choose between 1 of 3 skins. “light”, “leaf” and “insect” are the available skins. day: The day of the month the calendar should initially show. By default it’s the current day. month: The month of the year the calendar should initially show. By default it’s the current month. year: The year the calendar should initially show. By default it’s the current year.